Depending just how gourmet your kids are you may or may not consider this a weekend family breakfast. But certainly traditional eggs benedict fit the bill for a decadent Valentines breakfast and if your kids are teenagers maybe you could teach them how to make it and serve you breakfast in bed. Possibly by Mother’s Day they’ll have mastered it! I’ve got to be honest, poached eggs are my nemesis and I do chicken out (no pun intended) by using Lakeland’s silicone poaching pods – or horror of horrors, the microwave on very low power – rather than fancy swirling about in boiling water. BUT – I’d never come across this nippy technique by Matt Follas whereby you pre-cook the eggs in their shells for 10 seconds before you break them. Still, if we can’t expect genius from former Masterchef winners, who can we? In a bowl, whisk 2 egg yolks, lemon juice and vinegar. In a small saucepan, melt the butter on a gentle heat, the butter should foam as it burns-off the water. As soon as the foaming starts to reduce, pour it (in a slow trickle) in to the egg mixture, whilst whisking. Continue whisking until the butter is fully combined. Add a pinch of salt to season. Poach 2 happy eggs. A great trick, to hold the egg together when cooking, is to place the whole egg (shell on) in simmering water for 10 seconds, then place it in cold water until it’s cool enough to touch. Next, crack it open and place into simmering water and cook for 3 minutes. Add a few drops of vinegar to the water too. Split and toast the English muffins, butter them and place on a plate. 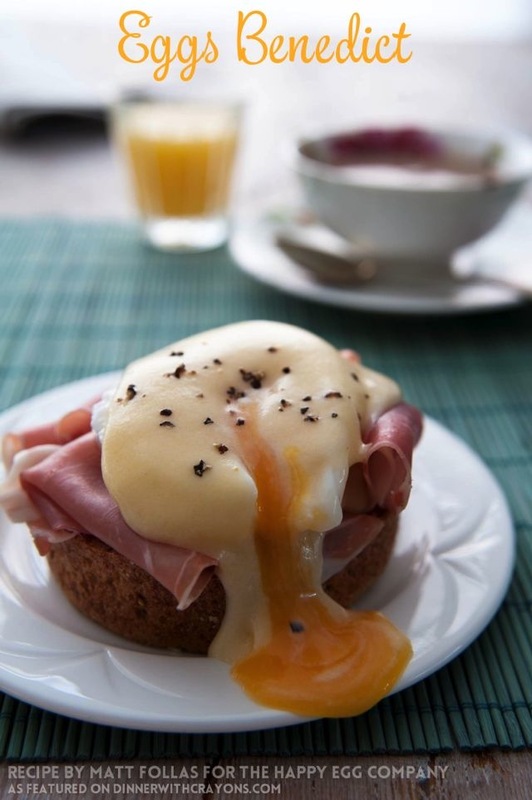 Arrange the ham on top followed by the poached eggs and a generous helping of hollandaise sauce. Top with a sprinkle of cracked black pepper. With thanks to Happy Egg Co for sample eggs! I also chicken out of poaching and use poach pods OR more recently, greased clingfilm. You put a large square of clingfilm over a cup, push it into the cup slightly and break the egg into the dip. Then twist the clingfilm to seal and pop into the water. They look much more like “proper” poached eggs. I shall have to try that as well! The clingfilm won’t melt though will it? Or do you twist it off once they’re cooked on outside? Slurp that looks good, well minus the bacon for me obviously. I think if you don’t worry too much about poaching eggs it is easy. I swirl the water and break them in and they are fine. Not always the perfect shape, but they burst open just as beautifully! To be honest it’s ages since I tried but they were such a mess it put me off 🙁 I must try again this weekend. Yum!!!! I adore poached eggs, as do the boys. I swirl the water with some vinegar in and that usually does the trick. They’re not always perfect looking and can be a bit frondy, but they burst open and taste lush. My mum gave me an egg poacher pan which is a lidded shallow pan that you fill with a little water, it has holes in which little dishes sit to put the eggs. Far too much of a faff tbh! I told Ed about this trick and it really does work an absolute treat! Thank you for telling me about it!